The global oncology biosimilars market is predicted to benefit immensely with the rising demand for affordable therapies for cancer. This is because cancer is presently the costliest health affair in terms of both diagnosis and treatment. Pharmaceutical companies worldwide are hard-focused on developing biosimilars and generic medicines to combat cancer at all stages and also for the treatment of the disease. On the down side, complex infrastructure needed for the development of biosimilars and lengthy process for the approval of biosimilars is providing headwinds to the market’s growth. 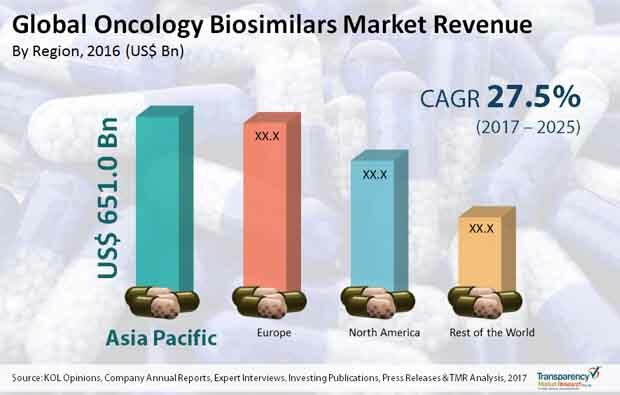 A report by Transparency Market Research estimates the global oncology biosimilars market to expand at an outstanding 27.5% CAGR between 2017 and 2025, for the market to become worth US$17,478.2 mn by the end of 2025 considerably up from its evaluated worth ofUS$2,100 mn in 2016. The report studies the global oncology biosimilars market based on a few parameters. The segments into which the oncology biosimilars market is divided depending upon drug class are G-CSF, monoclonal antibody, and hematopoietic agents. In 2016, the G-CSF segment dominated the market in terms of revenue, and the segment is expected to lead until the end of 2025. The G-CSF drug class segment is leading mainly because of a robust pipeline of oncology biosimilars of key players in the market. Moreover, patent expirations of reference biologics is contributing to the growth of G-CSF drug class segment. Based on disease indication the market has been segmented into breast cancer, blood cancer, colorectal cancer, non-small cell lung cancer, neutropenia, and others. Blood cancer segment has been further sub-segmented into leukemia and non-Hodgkin’s lymphoma. Of them, neutropenia led the market in 2016. Going forward too, neutropenia segment is anticipated to remain dominant over the forecast period. The strong growth of this segment is attributed to patent expiration of blockbuster oncology biologics and efforts from several governments to make affordable medicines accessible to patients. Also, the growth of neutropenia segment is driven by approvals received by numerous manufacturers in Europe to manufacture filgrastim and Peg-Filgrastim. The blood cancer segment is predicted to display a robust CAGR over the forecast period owing to a large number of pipeline of biosimilars, and the rising adoption of biosimilars among physicians and patients. On the basis of distribution channel, the segments into which the global oncology biosimilars market has been segmented in this report are hospital pharmacy, retail pharmacy, and online pharmacy. Vis-à-vis revenue, hospital pharmacy led the market in 2016, and the segment is expected to remain dominant over the forecast period. Geography-wise, North America, Europe, Asia Pacific, and Rest of the World are key segments that divide the global oncology biosimilars market. Asia Pacific held a significant share of the oncology biosimilars market in 2016. This is mainly because of low cost of biosimilars as compared to original reference biologics and availability of cost effective and safe cancer medications via retail stores in this region. In addition, focus of leading players in the region to enter to strategic alliances for expanding outreach is also benefitting the Asia Pacific oncology biosimilars market. Leading companies in the global oncology biosimilars market that are profiled in this report are Celltrion Inc., Biocon, Dr. Reddy’s Laboratories Ltd., STADA Arzneimittel AG, Intas Pharmaceuticals Ltd., Pfizer Inc., Sandoz International GmbH, Teva Pharmaceutical Industries Ltd., Apotex Inc., and BIOCAD. A noticeable trend in the market for oncology biosimilars is prominent pharmaceutical companies forming strategic alliances with well-known generic manufacturers to formulate biosimilars. One example in this direction is Biocon collaborting with Mylan to develop a strong portfolio of biosimilars, including monoclonal antibodies and recombinant proteins. Depending upon the class of drugs, the global market for oncology biosimilars can be divided into monoclonal antibody, G-CSF, and hematopoietic agents. The segment of G-CSF among them currently pulls in maximum revenue. Patent expirations of reference biologics is also serving to drive growth in the market. In the near future too, the segment is expected to generate maximum revenue on the back of robust pipeline of oncology biosimilars. Cancer is said to be the second-leading cause of death worldwide. What makes it particularly dreadful is the fact that there are limited therapies for it and those are usually very expensive. However, emergence of biologics for their treatment has reduced the cost burden on patients sufficiently. Biosimilars are molecules that match the efficacy and potency of the original reference biologic and yet are cheaper. In addition, they are easy to manufacture. All the aforementioned coupled with the expiration of original reference biologic is upping the demand for oncology biosimilars. Pharmaceutical companies across the world are focused on formulating biosimilars and generic medicines to deal with cancer at various stages. This is expected to benefit the market for oncology biosimilars in the near future. However, the complicated infrastructure required for the development of biosimilars and the lengthy approval process is posing a challenge to the market. The global oncology biosimilars market can be classified into blood cancer, breast cancer, non-small cell lung cancer, neutropenia, colorectal cancer, and others based on the disease indication. The segment of blood cancer can be further divided into non-Hodgkin’s lymphoma and leukemia. The segment of neutropenia accounts for a leading share in the market at present. One of the reasons behind it is the approvals won by many manufacturers in Europe to manufacture filgrastim and Peg-Filgrastim. North America, Asia Pacific, Europe, and the Rest of the World are some of the key regions in the global market for oncology biosimilars that have been studied in the report. Asia Pacific, among them, holds a considerable share in the market. This is mainly because the low cost biosimilars are perfectly suited to the budgets of the people in the region who do not have the means to spend on expensive drugs. Biosimilars cost much less than the original reference biologics. Apart from that, easy availability of safe cancer medications in retail outlets along with focus of leading players on carefully-considered alliances in the region is also helping the market. Some of the prominent participants in the global market for oncology biosimilars are Celltrion Inc., Biocon, STADA Arzneimittel AG, Dr. Reddy’s Laboratories Ltd., Pfizer Inc., Intas Pharmaceuticals Ltd., Sandoz International GmbH, BIOCAD, and Teva Pharmaceutical Industries Ltd.